Restaurants line a street of the Quartier Latin in central Paris. As the United States struggles to cope with obesity rates, France is often looked to as a counterexample. Yet obesity is on the rise there as well now, and though French culinary traditions are often credited with keeping people trim, some worry those eating habits are under assault. French obesity rates are still far below those of the United States and other European countries. One might think they would be a lot worse. The shops and outdoor markets are full of pastries, meats and cheeses, and people are always talking about food. It turns out that it’s not only what the French eat but how they eat that seems to make a difference. From the start, French children are taught to respect the ritual of mealtimes and the beauty of a well-balanced diet. At one public day care center in Paris, 2-and-a-half-year-olds sit around a table for a hot lunch. The tiny diners wear napkins at their necks and are taught the proper use of cutlery. A recent menu featured grilled leg of lamb and cauliflower au gratin, all freshly prepared in the day care’s own kitchen. Even at this age, the French believe dinnertime should be a moment of pleasure and conviviality. In France, starting each child with a solid culinary base in life is considered well worth the investment in time and money. Dr. Jean Marc Catheline, an obesity specialist, says the French obsession with food is exactly what has protected them against obesity. However, Catheline says urbanization, immigration and globalization are moving France away from its eating traditions. Many young people are no longer interested in learning how to cook, he says, and the ritual of mealtimes is being forgotten. As a result, obesity is growing. Nearly 14 percent of the French adult population is now obese, compared with 8 percent just 10 years ago. Though these rates are still half those of the United States, the French government isn’t taking it lightly. The national obesity plan includes hip television ads encouraging people to eat the right foods, take the stairs and not to snack between meals. Vending machines have been removed from schools. As in the U.S., Catheline says, obesity rates in France are higher in rural areas, where people drive everywhere. Obesity is also a bigger problem among the poor. “There are some places in France where obesity levels are as high as in the U.S., like in poor, immigrant communities. So as we watch U.S. rates rise, this is extremely worrying for us,” he says. French visitors to the U.S. are often surprised by the way people eat. Lea Bresier, who spent a year teaching French in Virginia, says there seemed to be no order or rules to eating there. “When I was in the U.S., everybody, they are eating all the time in the streets. They always have something in their hands, like Coke or sweet drinks, and they are always eating in their car,” Bresier says. 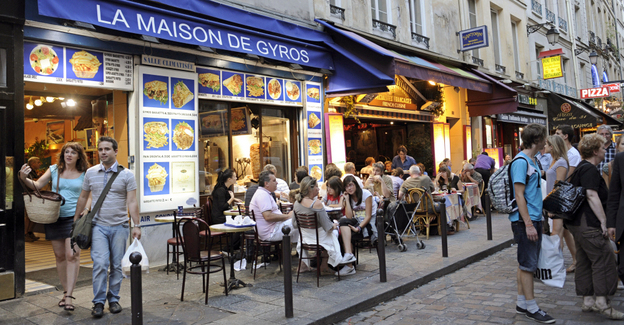 The un-French habit of eating anywhere, anytime, seems to be catching on in France, especially with young people. It’s not uncommon to see teenagers drinking out of liter bottles of soda while hanging out in the street — an unthinkable sight even a few years ago. Pauline and Bertrand Dubois, who are in their late 30s, are raising their two young children the way they grew up, with regular family mealtimes. A normal dinner for the Dubois family includes ham and a puree blended from fresh vegetables. Bertrand Dubois worries American pop culture is changing French eating habits. The importance of cooking fresh food and avoiding dependence on high-calorie, processed food is at the heart of efforts to reduce obesity in France. It’s not complicated, says Catheline. I think this is especially interesting when compared to the “French Paradox,” and you have both situations in the same country. I mean, granted, you could very well view the same comparison in the U.S., but the U.S. doesn’t have generations of people who view food the way France does; and the U.S. doesn’t have those kinds of people in positions of power the way France might. Last May, researchers writing in the British Medical Journal came up with the least cheerful hypothesis of all. They argued that it’s just a matter of time before the French — who are in fact eating more hamburgers and french fries these days — catch up with Americans, and begin suffering the same high rates of cardiovascular disease. These researchers, Malcolm Law and Nicholas Wald (who must have thought up their hypothesis over dry kidney pie, while dreaming of the kind of duck in red wine and honey sauce I had with Claude Fischler), call this the “time lag explanation” for the French Paradox. As far as they are concerned, the McDonaldization (this is a French catch-all term for the importation of fast food and other American cultural horrors) of France will continue at a frantic pace, and it is as inevitable that French men will start keeling over of heart attacks as it is that French women will eventually wear jean shorts and marshmallow tennis shoes on the streets of Paris. Now, there are a lot of cultural mores that we could discuss in regards to how certain cultures – like, for example, the French – view food (and any of you out there with additional insight, feel free to share… I have my thoughts but I certainly wouldn’t claim to know it all), but no matter what culture you’re observing, there’s always one constant: the food is as minimally processed as possible. It never fails. It’s bad all over the world. I hear that obesity and diabetes are on the rise in Abu Dhabi. I once lived in Senegal, a former French colony. Breakfast was a hunk of freshly baked baguette, butter (maybe a smear of blue cheese) and chocolate. Adults had coffee. More bread with jam for the 10am snack at school. Home by 12:30 for lunch: some fish based stew with vegetables served over rice. Fish and vegetables were bought that morning by the cook from local fishermen and farmer’s mkt. Mint tea with sugar cubes after lunch. Siesta. Back at school at 3pm. Home again by 5:30pm. Snack of whatever fruit was ripe on the backyard trees. Dinner by 7pm: Pan fried fish, green lettuce salad with vinaigrette, & french fried potatoes. Maybe some sweetened tea before bed. This was our meal plan with the exception of chicken on Sundays, and porridge on the weekends. Lamb was available maybe twice a month. No pork. Beef maybe twice a year. Nothing deep fried and no “walk and eat” foods unless we were on an outing. And we walked EVERYWHERE! The library was 12 blocks from the house, and I walked that whenever I was allowed by myself. No one would bother a child… As children, we rarely ate out. We were taught how to use silverware correctly from the beginning. The penalty was a missed meal if we used bad table manners. I remember the first time I ate a lamb swarma sandwich at a fair. A real meat sandwich in Senegal!!! When my African cousins came visit us in the States, they couldn’t believe the drive-thru fastfood places all over, the ice cream, the donuts stores… Each one gained at least 20lbs over their 3-4 month stay. Erika, I’ve been following Gary Taubes’ work on evolutionary/Paleolithic eating and his studies into nutritional science (and I believe u did a post on his work as well). I think he, or another researcher in that vein, noted that in addition to eating in a disciplined manner, the French have a traditional diet that is high in fat and limit their sugar consumption to delicious desserts eaten in small portions. Sugar is not found in everything like it is in the US so even if they do eat bread it’s not fortified with sugar/fructose like bread is in here. In addition, they eat real food, not processed like us North Americans do. Now that the young French people are starting to copy the Americans, you’re seeing people with pop drinks on the street, more junk/processed food high in sugar and preservaties and random eating patterns. As an aside, when I first visited the States (Wisconsin) I noticed the incredibly large numbers of people coming into work drinking large bottles of Coke first thing in the morning. My co-workers noticed this same phenomena in Washington. We’re Canadians and we have an obesity problem as well but for some reason the Coke thing in the morning really stood out for me. Yep – I’ve read both of his books. And while he’s a bit of a hypocrite, he’s done some damned good work. Now I don’t feel as bad when I eat Brie and apples lol. You can’t tell me there isn’t something to the French (or any other country who has continued their cultural eating traditions) eating tradition. Just look at us from a purely observational stand point. We too were low in our weight prior to the 80’s (when HFC syrup and etc, was introduced) and we still got food fresh and cooked. MCD’s was a treat for us (and I’m 40). Even though I was “overweight” as a child, it was nothing compared to these kids today. I can remember only one person in my high school who would be considered obese. Most of the other kids where their age weight appropriate or like me overweight/chubby. And this was the 80’s and part of the 90’s. So you can’t convince me the French don’t have it right to some degree because when we all ate butter, beef, creams, etc we definitely weren’t in the weight ranges and disease ranges we are now. This is very interesting. When I first heard of the French Paradox, it was in an article that speculated that the French stay slim due to the large amount of antioxidants in the wine that they drink regularly with meals. This same article said that drinking black and green teas on a regular basis could give us the same benefits. While I do believe that tea is very healthy (my mom and I drink it all the time), I found it very hard to believe that something like tea or wine would be the difference between being slim and being obese. Reading this post, the French Paradox makes much more sense to me. The French have a tradition of eating clean, and we don’t. That makes all of the difference. I have also heard that many French citizens are FURIOUS at the “McDonaldization” of their country, and rightly so. I love America, and I live being American, but our eating habits are horrible. I think that the fact that our way of eating is one of the most well-known and widespread aspects of our culture is pretty bad. I think it’s all a lot more complex than just “eat like the French”. You’d have to restructure your entire life to mimic theirs, and most of us simply can’t do that. Lunch from 12:30 to 2:30? I wish, but my workday is long enough as it is. There aren’t any farmer’s markets near where I live, and the only bakeries are the ones in the supermarkets. There are only so many hours in my days and weekends; daily shopping for the freshest baguettes and produce is not really an option (and this is from somebody who actually loves to grocery-shop). That said: Of course you can eat “fattening” foods and not get fat. You just have to eat less and move more. Seriously. I just ate a wedge of brie and some French bread for lunch, but it was two not-exceptionally-thick slices of bread and about an ounce of cheese, not a big plate-full. I have to say, though, that I’m a bit tired of the generalization about American food and eating habits. Okay, yes; the point is that it’s a generalization, but the junk-food culture is not monolithic, even among Americans–I certainly don’t sit around swigging liters of Coke, I don’t live on restaurant and boxed food, I don’t eat in my car or on the hoof. Nobody is putting a gun to France’s head and forcing them to eat Whoppers and wear ugly tourist clothes. If they see their countrymen turning into that, they can blame them for adopting it. @ LBC: I going to have to disagree with you on this. The junk food industry is a BIG problem in this country. I’ve stopped watching most regular television because the adverts are ridiculous- in number and subject matter. Yes, we need to restructure our lives because our health and families are suffering. Too much stress, bad diets, and not enough time for *anything other than work. * Granted, there are some professions that are very demanding but most of us could stand to revamp our jobs so we work smarter rather than harder and longer. You may not eat on the go but there are so many others who eat at their desk while working, eat while standing up at home, eat in their car and the list goes on… These day-to-day activities are counter productive to the benefits of sitting around the dinner table. This, unfortunately, has become the norm. We used to eat around the dinner table. Some of us have maintained that tradition, but how many? Sure, we can blame the kids. Hmmm, maybe we should stop having children since we don’t have time to work and care for a family. Is that the answer? I think we can do better than that. One advantage to living in America is the size of our refrigerators. Many Europeans have small refrigerators so they have to shop more often. There are ways around the freshness issue. cook and freeze anyone? blanche and freeze? If we have time to buy frozen meals then we have time to walk a couple of paces to the left and buy frozen vegetables. Baking bread is easy peasy. Food deserts are another beast that requires the community to rally and demand better quality. So the point of my rant is that we can look to the French as a reminder of how we used to value quality food and meal time as a country. It’s time. Let’s do it for our children. priorities, priorities, priorities. @ LBC. It’s not so much about what you eat and how long, but the quality of the food and the quality of the time spent enjoying the meal. You could scarf down a microwave burrito while paying bills online or take the same 20-30mins and savor the same burrito while listening to salsa music, some fresh fruit, and a green salad. And as for food choices… You can pack a lunch of quiche, salad, and fresh fruit. You can make a stir fried rice dish and add egg and meat to it for lunch, or just leave it with vegetables for a side dish. You can get a baguette for 2 days, and then pita bread or naan or some other flat bread that keeps well for the rest of the week. Or crackers! As for the rest of it, sometimes you eat food because it’s in your face all day long. Some fast food can taste good at first. To me, even fresh off the grill greasy burgers at a diner taste better than most fast food. But I’ve succumbed to the aroma of fried grease when I’ve been hungry, away from home, and broke. That stuff is always going to be cheaper than real food. Why do you think they market it towards teens? I’m not sure what either of you saw in my comment. Sydney: I didn’t say the fast-food industry wasn’t a problem: I said it wasn’t a way of life for all of us. Because it’s not. Not only is it a problem, it’s a problem in countries other than the U.S., but there are lots of Americans who don’t eat that way. I don’t, and I know plenty of people who don’t. As for working smarter rather than longer: Most of us don’t get to choose our schedules. I’m very lucky that my employer offered me a 4/10 schedule instead of a 5/8 so I only have to drive to work four days a week, but I still need forty hours. My line of work does not allow me to work from home or take projects out of the office, which is good because it means I can’t fill up my evenings with extra job obligations. I have a much simpler life than most Americans, but that doesn’t mean I want or am able to spend my extra evening time shopping for food. I can buy good-quality food once a week and do other enriching things–exercise, read, visit–with the saved time. JoAnna: What’s with the food lecture? I brown-bag lunch every single day and it’s almost always homemade (occasionally it’s good restaurant leftovers, but I don’t eat out very much). Fast food is not cheaper than “real” food, unless you don’t know how to shop or cook. I can feed myself on $25 in groceries for a week, no problem, but I can’t buy a week’s worth of fast-food meals for that. As for being marketed to teenagers: Yeah, it is, because they’re easy targets. They’re busy, they don’t do the family shopping, the generally don’t want to cook, it’s “cooler” than home cooking, and they haven’t figured out yet that their food choices will catch up with them eventually. I wanted to react sooner but was away for a while. Anyway, as a French person, here’s my two cents. I’m afraid I read the news a few days ago so I don’t remember exactly all that was being said, I’d like to point out, though, that it made me both cringe and laugh at the same time. I remember reading the comments from the French doctor, utterly bewildered, to the point where I started wondering if this guy and I know, and live in, the same country. Let me get this clear: yes, we do have regular eating patterns, or at least fairly regular. Yes, I believe junk food is (or maybe was?) less available, and, for instance, when I was a child (I’m now 29), soft drinks were unheard of on the table, the choice drink for children being water (this may have changed with the younger generations, though). On the other hand, I grew up with McDonald (though my brother and I were fortunate enough to have parents who never took us there. Consequently, my brother never ate there and I went only twice in my teens) and pasta, rice and instant mash potato meals with a slice of ham where all the rage around my friends as their parents didn’t bother to cook most of the time (again, we were fortunate that my mother loved to). So healthy “gourmet” meals…? Sorry, but once again, no. The majority of French people never see a vegetable in their normal eating day (fruit and veggies are deemed as too pricey, but as people prefer buying and eating crap, no wonder…), unless it is the tomato paste or sauce they pour on their pasta/ pasta usually laden with cream or grated cheese too. Same for rice. Meat is ever present (otherwise it’s not a meal…). The upper middle class is perhaps getting those well-balanced dream meals this doctor is talking about, but that only shows that he is totally disconnected from reality. As for lunch break lasting for 2 hours, who is kidding who? Perhaps some are still getting those, but believe me, that’s not the majority. For most it’s 1 hour or even just 20 mn, and this time is allotted to finding, purchasing and eating a sandwich (white-flour baguette with a filling of ham and butter being the national favorite, it seems) in most cases (or going to the restaurant in some cases, that’s true too). I don’ know where the idealistic images of young children having veggies and leg of lamb for lunch is coming from either but don’t get me started on it. I ate for 15 years in a cafeteria and I still shudder at the thought. Most of the time, the food is inedible, so bad it is cooked. I concede this may have changed, but certainly not to the point described in the original article/ study. Or, once again, perhaps the most privileged children are getting this kind of meals but it is certainly not widespread. I’d like also to add that giving a fancy name to a meal doesn’t’ make it tasty. Lastly, someone commented on French bakeries and farmers’ markets. Our bakeries are full of refined carbs. Our breads are mostly made from white flour, sourdough wholemeal bread (the only kind of healthy bread) being a thing of the long dead past for most of us (you can still get your hands on some, but as any quality food these days, it’s pricey and not everyone can afford it). I suggest some do research on “viennoiseries”, “pain au chocolat”, “croissant”, “pain aux raisins” and other kinds of pastries, to find out what our bakeries are full of. As for the farmers’ markets, we may have more than in the USA, I don’t know, but for the most part, they are overrated. Especially since the quality of the produce has been on a downward slope these last 10 years. And let’s not forget that most people get their food from the supermarket anyway (where they buy tons of crappy food such as frozen meals, cold-cuts, ready-made pudding full of dairy, etc). The French, overall, may be the slimmest but they are not the happiest. We are the leading nation when it comes to drug intake per capita, and these drug include a not-so-healthy dose of antidepressant. Sorry for this very long post; I must admit that I was incensed when I read about this on the web as, in my opinion, most of what is described as the French way of life (or former way of life, it seems) is outward lies and is akin to the airbrushed pictures you see everywhere: presenting as real and reachable something with isn’t and can’t be reached for most of us. So, sorry again for ranting on your blog, Erika, but I really thought truth had to be told. Also, in all fairness, I would like to say that I’m a slightly overweight vegan French woman who “flees” her country whenever she can, so perhaps I’m a little biased (and not in their favour) when it comes to speaking of my fellow citizens. THIS is what I was looking for: a polite reminder that no country’s people are so monolithic. I know that we have a habit of romanticizing other countries, but the marketing for Dukan was what made me step back and say “wait a minute.” I seriously appreciate this. For the dukan diet it is not a safe diet and recently a well know nutritionist was able to states publicly that it is indeed an unsafe diet. However, it would be interesting to point out that the dukan diet is not a good example as the majority of people doing the dukan diet usually do NOT need to loose those 5 kilos but do it because of the pressure of like Axelle said it to stay slim. As for the Dukan diet, well, fortunately, it has been (and still is) debunked, but I’m afraid it’s still not enough to unhook people from it. Why people would choose to do this to themselves is still a mystery for me, as for the “doctor” who designed it… well…. Everyone needs to watch the cooking shows on PBS more. It’s so beautiful how they cook. Even the white people (not to be unfair but I didn’t think they would condone ever eating more than less) are cooking beautiful meals. They aren’t afraid of fat or anything like that. They just like to make good food. I admire them for that. However, we do have to remember not to eat everything of every delicious meal we see. Nonetheless, food is good.